When less than a week ago I had all my most valuable possessions stolen from my pickup in Portland (which I described in A Serious Loss) while walking in Tryon Park, I mentioned that I lost my recently acquired books on object oriented ontology (Harman’s Guerrilla Metaphysics and Meillassoux’s After Finitude) and that this has slowed down my work in this area. I didn’t mention that although I lost my computer, my books, and my notebooks of ideas, the thieves left my cassettes of lectures on the philosophy of science untouched on the seat. Am I to conclude from this selective loss that the thieves were speculative realists and therefore not the kind of people who would want lectures on the philosophy of science or to whom one would want to rent a room? Not likely. Just a few days ago in Naturalism and Object Oriented Ontology I mentioned the engagement of OOO with contemporary science. The criminal mind must remain a mystery to us. 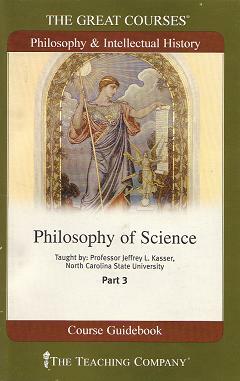 The lectures are a series of 36 half hour talks on the philosophy of science as delivered by Professor Jeffrey L. Kasser of North Carolina State University and published by The Teaching Company (whose lectures I have had occasion to mention many times previously). Since I didn’t lose these, I was able to continue listening to them even while the rest of my work was rudely interrupted. In lecture 26 on scientific realism I was interested to note that Professor Kasser invokes what he calls metaphysical modesty. 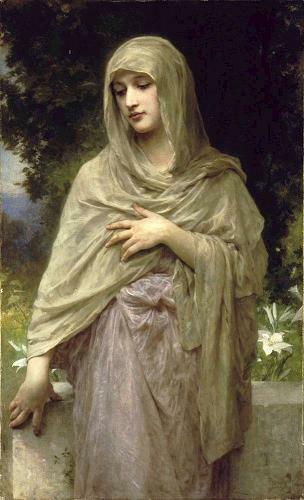 The Professor characterizes metaphysical modesty as, “The way the world is does not depend on what we think about it.” Now, this is simply an alternative formulation of realism, but Kasser has chosen to express realism as a moral virtue, and particular as the moral virtue of metaphysical modesty. 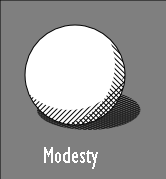 Metaphysical modesty may be a little more plain that the more traditional virtue, but it is more universally serviceable. I particularly noticed this use of metaphysical modesty because I had written a post on metaphysical responsibility, a term that I had picked up from the book Shop Class as Soulcraft by Matthew B. Crawford, which I initially mentioned in Back to shop class! Crawford introduces metaphysical responsibility as a responsibility that he has to inanimate objects (in his example it is a motorcycle that he is working on) in contradistinction to his fiduciary responsibility to the person paying for the work that he is doing. I suggested that this conception of metaphysical responsibility could serve as a point of entry to an object oriented axiology. 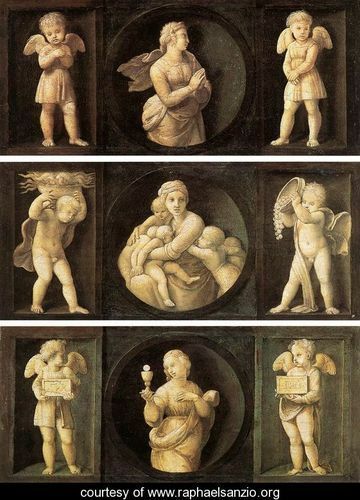 Three of the four cardinal virtues as depicted by Raphael. Although Kasser is coming from a different perspective and from a different tradition, his mentioning of metaphysical modesty immediately made me realize that we could systematically expand our conception of object oriented axiology by re-formulating and re-conceptualizing all the virtues of traditional axiology in terms that are blind to human privilege and which make them metaphysically as application to any one object as to another. Again, the object oriented virtues are plain in comparison to the tradition, but no less morally edifying. 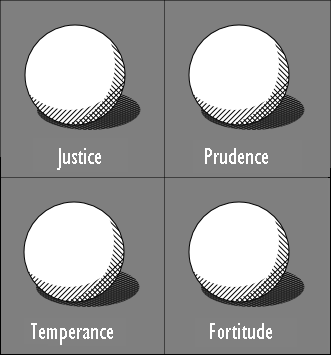 For example, if we take the traditional cardinal virtues of justice, temperance, prudence, and fortitude, corresponding to these in an object oriented axiology there will be metaphysical justice, metaphysical temperance, metaphysical prudence, and metaphysical fortitude. For some of these it would be difficult, right off the top of one’s head, to form a clear conception of what such a virtue would be if conceived in the context of an object oriented ontology and axiology, but the investment of a little thought would probably make this clearer to us over time. It might be a little more of a stretch to find object oriented equivalents for the theological virtues, but these will no doubt be forthcoming once an object oriented theology has been formulated. 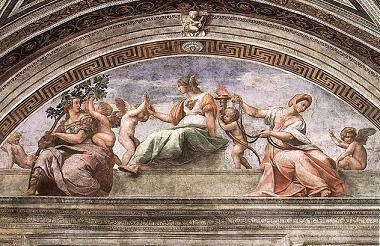 If we wanted to go even further afield we could posit object oriented equivalents of the theological virtues, to whit, metaphysical faith, metaphysical hope, and metaphysical charity. While I certainly won’t be the one to attempt to formulate an object oriented theology, I am equally certain that it is not far in the offing.